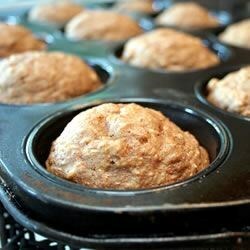 "These hearty muffins will fill you up with fiber and flavor instead of fat." Place oats in a small bowl, pour in buttermilk. Let sit for two hours at room temperature. In a large bowl, stir together whole wheat flour, baking powder, baking soda and brown sugar. Stir in oat/buttermilk mixture, applesauce and egg; mix well. Pour batter into prepared muffin cups. Bake in preheated oven for 30 minutes, until a toothpick inserted into center of muffin comes out clean. These muffins were really good. I did add cinnamon and raisens to mine and before baking I did sprinkle a little bit of cinnamon and sugar on top. My co-workers liked them as well as my kids.